In February 2008, when Polaroid announced that it would cease production on all instant film, director Grant Hamilton chose to tell the story of this beloved photographic medium which resulted in his first ever feature length film, TIME ZERO: The Last Year of Polaroid Film (2012). Sherry Saunders: Since you’ve never made a film before TIME ZERO, what did you do to prepare for this film, and why did you decide to take the leap now (or four years ago when you began)? Grant Hamilton: This is our first movie. I am a photographer though so I wasn’t afraid of the equipment at least. It was scary to think about the challenges of organizing and editing the footage to tell a compelling story. To prepare, I read a couple of books about filmmaking so I had the basics and speak the language. SS: I’m interested in your background as a designer, artist and doctor. How do these experiences influence your work on this film? GH: I think the common thread is that it doesn’t really occur to me that something might not work out so I’m willing to try just about anything. It’s fun to have these different adventures and collect experiences. SS: It seems (as one artist said in the film) that polaroids are as much about the experience of taking the photo as it is about the actual photograph. Do you feel that is why people are compelled to share stories about them? GH: Absolutely. Everyone has a Polaroid story. The social nature of instant photography is part of what makes it memorable and special. SS: I think it’s really interesting how an online community like Flickr was a big proponent for creating this film. How do you feel about this juxtaposition between the tangible photograph and the digital world? GH: TIME ZERO isn’t really about analog vs. digital. It’s about losing a connection to photography based on sharing a social experience. So, as a social network, I think Flickr is a natural component of the effort to reinvent instant film. SS: How do you feel about applications like Instagram and other digital photography that replicates the qualities of polaroids and film? GH: I think they validate the idea that, at its baseline, digital photos can be sterile. Instagram adds charm and interest by giving images more interesting light and some amount of unpredictability and charm. SS: Before seeing this film, I was aware of the Impossible Project, but after watching it, I truly got a sense of how difficult it was to complete and how impossible many people thought it really was. I really liked how that showed through in the film. Can you speak in any more detail about the anxiety that surrounded this project and what it would have meant for the team if they did not succeed? GH: There was a lot of anxiety. Polaroid spent four years inventing integral film and they had thousands of employees and several hundred million dollars. Impossible had fourteen people, a much more modest budget and one year. SS: What are your hopes and expectations for instant film in the future? And do you feel like there is any more of the story you’d like to tell? 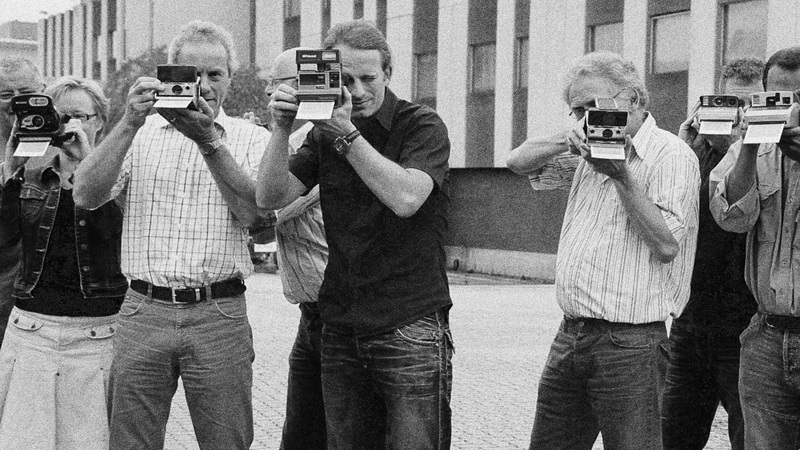 GH: I hope that the future of instant film is predictable, certain and boring. I don’t think I can handle it going away for a second time.